Safety, comfort and peace of mind combined with exceptional beauty and uncomplicated style features make this transfer bench practical and elegant looking. 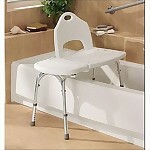 Includes a non-slip seating surface, adjustable height, and split seat to tuck your shower curtain. 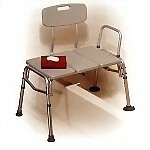 Durable, rust-proof construction makes this the perfect adjustable transfer bench for those who need assistance entering or exiting the bathtub. 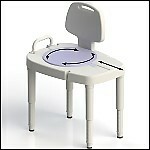 Includes height adjustable legs and removable back and arm. 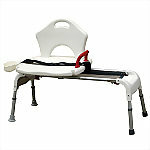 Sliding Transfer Bench slides left and right along the heavy duty frame for easy entry into and out of the tub. 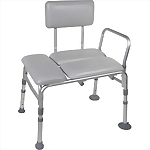 Sturdy, rust-proof aluminum frame with durable blow-molded seat includes ergonomic backrest, height adjustable legs, shower curtain opening, armrail, non-slip seat, and supports up to 400 lbs. 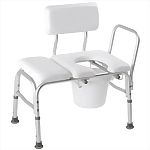 Cushioned seat and backrest provide comfortable bathing, while the durable aluminum frame of the transfer bench allow for safe and easy entry and exit of bathtub. Reduce fall risk by eliminating the need for a person to step over the side of a bathtub or shower ledge with a sliding and rotating seat that makes the process easier and safer. 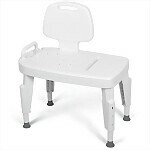 Deluxe vinyl padded transfer bench with commode opening is ideal for those who need assistance with bathtub transfers and prefer easier access for cleaning. Sturdy "A" frame aluminum 3-piece transfer tub bench features a durable, blow-molded plastic seat, 3-position backrest, height adjustable legs, suction cup feet inside tub, and tool-free assembly. 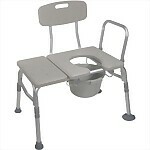 Features innovative wide post leg design for superior stability, spacious seat with rounded end for easy transfer, and support handle combined in a sleek, attractive design. 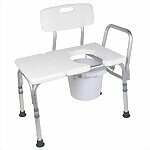 Sturdy transfer bench with cut-out, commode, and pail includes backrest, height-adjustable seat, textured, slip-resistant surface, shower curtain placement, and handrail. Compact design combined with its extra heavy 400 lb. 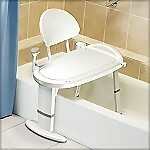 weight capacity is easy to assemble and dis-assemble for shared bathroom situations or travel. Reversible. 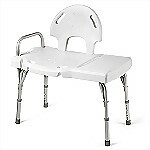 Combining transfer bench and commode in a durable, yet lightweight aluminum frame that holds up to 400 lbs. 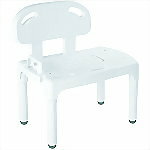 with an easy-to-clean plastic seat. Includes reversible handle and large suction cup feet.